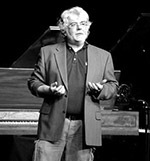 “MIDI Sonata” for piano, computer and synthesizer, as well as various piano recitals, have been broadcast live. He also performed Bernstein’s “Second Symphony” for the Saarland Radio. He appears on more than 25 CDs. In his compositional work, Delorko concerns himself equally with music for piano, chamber music, orchestral works and electronic music. Additionally, in 2002 he arranged “Pictures at an Exhibition” by Moussorgsky for piano and orchestra. When Steinway celebrated their “150 Year Jubilee” in 2003, Ratko Delorko created a program, “The History Of The Steinway Piano” for concert and CD, featuring 25 period instruments, at Steinway’s request. In addition to these CD productions, Ratko Delorko has recorded Beethoven’s “Piano Concertos WoO 4 and No. 2” on period instruments (the remaining Beethoven piano concertos are being prepared), produced a CD with the entire oeuvre of Gershwin (“Rhapsody In Blue”, “Preludes”, etc.) and released a live recording of the “Chopin Recital” at the Berlin Philharmonic. Ratko Delorko currently teaches Master Classes and lectures at the Hochschule für Musik und Darstellende Kunst Frankfurt (Music University of Frankfurt, Germany) in addition to his tour schedule. From 2007 on he performed and conducted masterclasses in Malaysia, Russia, Italy, the US and China. You can visit his website at www.delorko.com for more information.